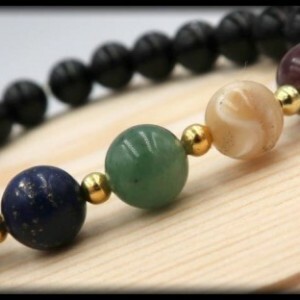 Overcome your fears and worries with this Black Onyx based bracelet. Black Onyx facilitates being the master of your own destiny, promotes vigor, and helps with accessing a higher guidance. It also helps one to make wise decisions, and absorbs energies from the universe to aid in healing. It also provides support in times of mental or physical stress. The attributes of Hematite helps to provide a feeling of stability, dissolves negative energy, boost self-esteem, and stimulates focus/ concentration. It is great for harmonizing the mind, body and spirit. Both stones are very beneficial to the Root Chakra. The Buddha charm piece helps to represent one attempting to gain a better understanding of life. 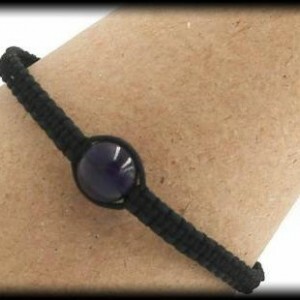 This handsome stretch bracelet is made with 8mm beads of Hematite and Black Onyx.